In an effort to bring more vending opportunities to the ever-growing population of food trucks, the Washington State Food Truck Association has been working to find new and underserved locations for food trucks. 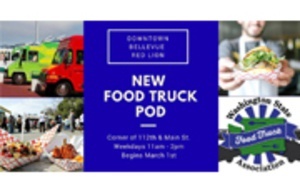 The Association has partnered with the Bellevue Red Lion and Wig Properties to bring more food truck lunches downtown, starting Thursday, March 1st. This location will offer a large variety of food trucks in the northwest corner of the Downtown Red Lion parking lot at the corner of 112th and Main St, adjacent to the new East Main transit station. The new food truck pod will be in service weekdays from 11am to 2pm to give downtown some new energy and bring unique food options to the area. The food trucks are hoping to see a lot of foot traffic from the neighboring Hilton hotel, Meydenbauer Center, City Hall, the police and fire departments, and local commuters. To see which trucks will participate and their menus, access the schedule via the Best Food Trucks website at https://www.bestfoodtrucks.com/lots/profile/867.